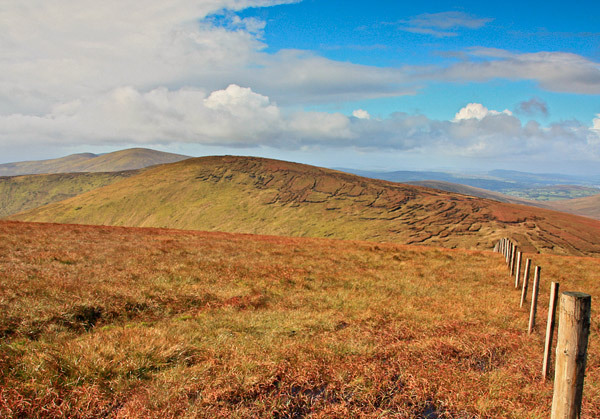 Meenard Mountain is the 254th highest place in Ireland. Meenard Mountain is the third highest point in county Derry. Picture from group : Meenard glitters in autumn light. Picture: Meenard glitters in autumn light. This is readily accessible as part of an extended walk to Mullaghaneany mountain starting from the B40 road at C70607 00374 A The views from here are superb, both north, west and south, with a real sense of wild remoteness. The summit can be reached by just following the fence line NW and then SW from Mullaghaneany. This can be most useful in poor visibility. The going can be soggy along the fence on the climb up from the col. It is best to keep slightly away from the fence line or use some nimble footwork. There is a nice little cairn on the summit which affords a useful wind-break for a couple of individuals. Unless you are heading west on the track to Meenard W Top, there is little reason to proceed further, but you could retrace your steps and head back via Oughtmore and Craighagh Hill for an excellent circuit taking around 5 hours in all.